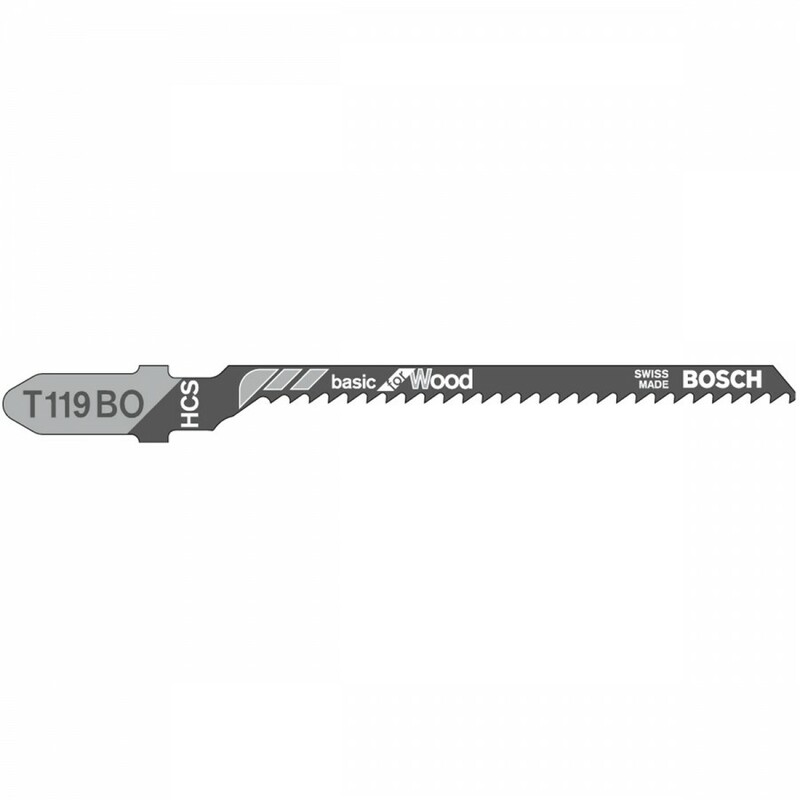 Bosch Jigsaw Blades for wood cutting Bosch is the world-wide market leader for jig saw blades. This means uncompromising quality, innovative ideas and universal use. Whether for miter, straight or curved cuts, Bosch sells the right saw blade designed for high performance in all major brand jig saws. T-shank blades suitable for jig saws from Bosch, Skil, AEG, Dewalt, Black&Decker, Hitachi, Makita, Metabo Bosch T119BO Basic for Wood blades Suitable for fast, curve cuts in Softwood (2-15 mm), OSB and plywood,fibre boards, chipboard, wood core plywood, especially for curve cuts and are ideal for jig saws without orbital action. HCS, wavy set, milled. total length-83 mm tooth spacing 2mm. Round cut, fine Bosch T144D Speed-for-Wood Jigsaw Blades Suitable for fast, coarse Softwood (5-50 mm), chipboard, wood core plywood, fiber boards, especially for Coarse Cross cuts and are ideal for speedier cutting. HCS, Side set, milled. total length-100mm, tooth spacing 4-5.2mm. Bosch T244D Speed-for-Wood Jigsaw Blades Suitable for fast, coarse Softwood (5-50 mm), chipboard, wood core plywood, fiber boards, especially for Coarse Cross cuts and are ideal for speedier cutting. HCS, Side set, Ground. total length-100mm, tooth spacing 4-5.2mm. Application : Softwood, OSB, Plywood 5/64" -1/4"
Optimized for curved or scroll cutting of wood and wood products 5/16 Inch to 1/4 Inch thickness.